When you find the fishing technique you prefer over all other styles, it’s quite easy to forget that other styles of fishing even exist! But at Van Isle Marina, we believe it’s never too late to try something new. If you’re new to the world of fishing, or just looking for another type of fishing style to master, check out our overview of the different types of fishing out there. As a community of enthusiastic boaters, our favourite way to fish involves anything off a boat. Whether it be angling, jigging, trolling, or fly fishing, we believe fishing from a boat is most effective because it gives you more access to different species of fish and ups your chances of a bite. Fishing on a boat is also comfortable and fun! Fortunately, many of these styles of fishing included in our list can be done from a boat. Angling – refers to using a hook attached to a line to catch fish. Angling is almost always done with some type of bait and sinker on the hook. It can be done on the shore, off a dock, or on a boat. Bank Fishing – a style of angling off a river bank or a similar shoreline, usually with a fishing rod, or less commonly, nets, traps, and spears. Bottom Fishing – this angling technique refers to fishing on the bottom of the seabed, usually for groundfish like suckerfish, bream, catfish, and crappie. A weight is added to the end of your line or rod. 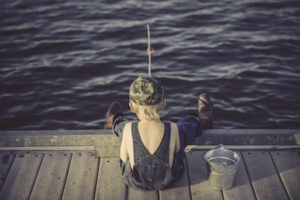 Casting – this refers to using a flexible fishing rod to throw (cast) your fishing line out, over, and into the water. Casting is a sport all on its own, regardless of any fish that are caught, with tournaments marking competitors on their accuracy and distance. Chartered Fishing – refers to fishing with or without a tour guide aboard a boat that you have hired for the duration of the trip. Charted fishing excursions can involve any number of techniques listed here. Commercial Fishing – fishing for profit. The commercial fishing industry is heavily regulated by Fisheries and Oceans Canada, a federal governing body. Droplining – refers to dropping a long fishing line straight down, without casting far off into the water. A dropline often has several hooks attached to it, although not as many as a longline. It’s a form of angling, meaning there is hook and bait involved, as well as a weight at the bottom and a float at the top. Fly Fishing – refers to a style of fishing in which artificial flies are used to lure fish to your line. It’s an older method of angling, particularly effective for trout, salmon, bass, carp, and more. Fly fishing is commonly done off the shores of river banks or standing right in the river. Hand-Gathering – Hand-gathering is the act of fishing with the simplest set of tools – your hands. There are many styles of hand-gathering fishing, such as simply picking up shellfish or clam digging at the beach. Pearl divers are also hand-gatherers, and divers can also fish for lobsters using just their hands. Handlining – a type of fishing using a single fishing line that is held in your hands. 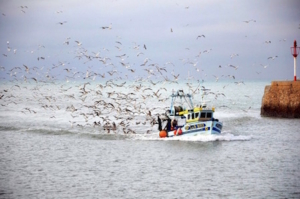 It can be done from boats or from the shore, mainly for catching groundfish. Ice Fishing – refers to fishing with lines and hooks through a small opening in a frozen body of water. Jigging – a popular style of angling in which a jig is the chosen type of fishing lure. A jig consists of a hook molded into a lead sinker that is covered by a soft coloured rubber. Kayak Fishing – this angling technique refers to fishing off the side of a kayak. Special considerations must be made on what equipment to carry, and how it will be fitted to the small-sized vessel. Kite Fishing – a unique style of angling, kites can be used for trolling a lure through water and provide people without boats or people with mobility issues greater access to hard to reach bodies of water. This type of fishing is more common in places such as the Pacific Islands and Australia. Longlining – this commercial fishing technique involves the use of a long heavy fishing line that has hundreds of baited hooks hanging from it via branches, a.k.a., “snoods”. Longlining is typically done on boats called longliners that use a special winch to haul in the line and operate in deeper waters. Longlining is a common method used to catch swordfish, tuna, halibut or sablefish. Cast nets: round, weighted nets, also called throw nets. Drift nets: nets that are not anchored. Hand nets: small, hand-held nets that remain opened using a hoop. Gill nets: a special net a fish cannot pass through without hooking its gills on the mesh. Trawl nets: large nets that are towed through the water by a boat called a trawler. Noodling – a style of hand-gathering fishing in which the “noodler” sticks their arm in a catfish hole, hoping for a bite. It’s dangerous, and therefore illegal in some states. Pitch Fishing – a method of angling which involves intentionally casting your line and lure out at a lower angle so that is enters the water quietly, so as not to scare the fish away. Recreational Fishing – fishing solely for fun. Recreational fishing is an overarching type of fishing that involves any number of techniques listed here, especially saltwater fishing and freshwater fishing. Remote Control Fishing – picture a floating drone rather than a flying drone, with a fishing rod attached to it, and you get a good idea of what remote control fishing is all about. Rock Fishing – a style of angling in which you are fishing off the edges of rocky jetties and cliffs. This is considered a highly dangerous type of fishing. Saltwater Fishing – fishing in salt waters (oceans). Also called “tidal waters fishing”. To fish in salt waters in BC, you must get a tidal waters fishing licence. Slabbing – used to catch bass, this line fishing technique involves constantly lifting and dropping a flat lead lure painted to look like a baitfish. To be most effective, the fishermen must first locate a school of fish using a fishfinder. Spearfishing – refers to any form of fishing that involves impaling the fish using a spear on a long pole. Spearfishing is usually done in shallower waters when the fish are visible. It requires you to be quick and precise with your movements. You can spearfish off a boat or by wading into the water. Bowfishing: involves using a bow and arrow to kill fish in shallow water from above. Harpooning: involves using a long spear-like tool often with barbs at the end. Pole spears: involves using a sling attached to the spear. Hawaiian slings: involves using a sling separate from the spear (slingshot or an underwater bow and arrow). Tridents: tridents are spears with three prongs rather than a single prong. Gigging: involves using small, trident-type spears to kill bullfrogs. Pike Poles: an older form of spearfishing, particularly used during ice fishing. Instead of a spearhead, two smaller, curved spikes were used. Spearguns: used for fishing and target practice, spearguns are deployed by divers underwater. There are threaded, lined, and break-away varieties. Sportfishing – refers to fishing competitively to see who can catch the heaviest fish, or who can catch the most fish. Sport fishing often involves large cash prizes and bragging rights for the winner. Surfcasting – refers to fishing from the shores of a saltwater beach. Surfcasting is a style of angling that requires a long surfcasting rod and the ability to cast a large distance. Tenkara Fishing – a Japanese style of fly fishing (angling) that was first done with a bamboo pole and no reel. Modern tenkara fishing rods use a tapered or level line and are mostly telescopic and made of graphite. Trapping – refers to the sinking of baited traps to the bottom of the seabed in the hopes fish swim into the trap. The traps resemble large cages and are commonly used for crab and lobster fishing. Trawling – the process of dropping a large net off the side of a slow-moving boat called a trawler. Trolling – a line fishing technique that involves slowly pulling one or more baited lines through the water. It can be done effortlessly off the side of a moving boat, or from land as you cast your line as far as you can and slowly reel the line back in. Trotlining – trotlining is a line fishing technique that is a lot like droplining, but the trotline’s hooks are suspended horizontally in the water, rather than vertically. This fishing technique is good for fishing across rivers. While we here are Van Isle Marina on Vancouver Island love a lazy afternoon of fishing from shore every now and then, we believe there’s no better feeling than reeling in a big one onto your motor yacht. If you’re on the market for a new fishing boat, check out our selection of fishing boats for sale. 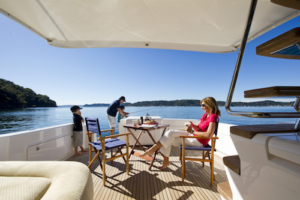 We invite you to learn more about our yacht sales process or come and see our marina in Sidney, BC. For tips on when to use lures or live bait, check out our Lures vs Live Bait debate. See a style of fishing not mentioned here? Contact us and let us know!